Elephant lover? Then you’re going to the right place. 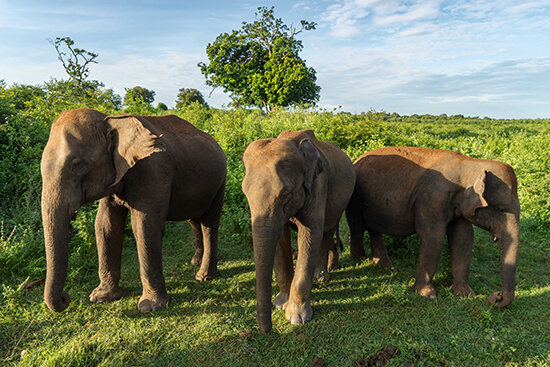 Sri Lanka has a choice of elephant orphanages or elephant safaris; however, for an ethical experience where the elephants aren’t in captivity or ridden, I’d go for Udawalawe National Park. It’s far more enjoyable (and responsible!) seeing animals in the wild, and you’re 99% guaranteed to see an elephant. Staying near the park is common, safari Jeep rental is easy (driver included, guide is additional), and you pay for park entry on arrival at the gate. When travelling around Sri Lanka there are quite a few options: bus, car, tuk-tuk or train ride. But even if you've hired a private car, be sure to try at least one train ride through the hill country. The wonderfully windy routes keep you entertained and mesmerised with their unbelievably beautiful scenery. The journey from Ella to Kandy (or the reverse) is basically an attraction in itself. Buy tickets the day before you travel just in case they sell out and bag yourself a window seat if possible. A visit to the hill country isn’t complete without a tea estate visit. They provide an eye-opening insight into one of Sri Lanka’s most important industries, and you're left with a heightened appreciation of the amount of work that goes into a single cup – and that isn’t because you’re hopped up on caffeine! 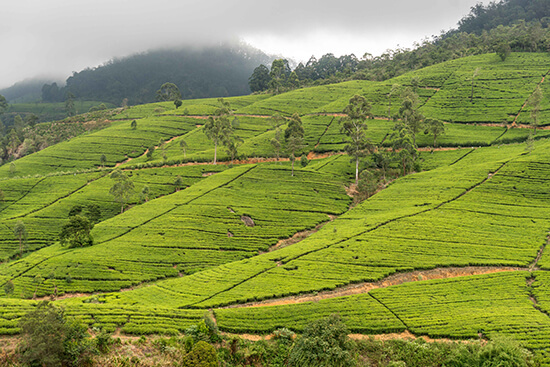 The high-up Nuwara Eliya is a great place to explore different tea estates and try one of the lightest, most fragrant Ceylon teas in the country. If you’re keen, they’ll even let you pick your own tea. 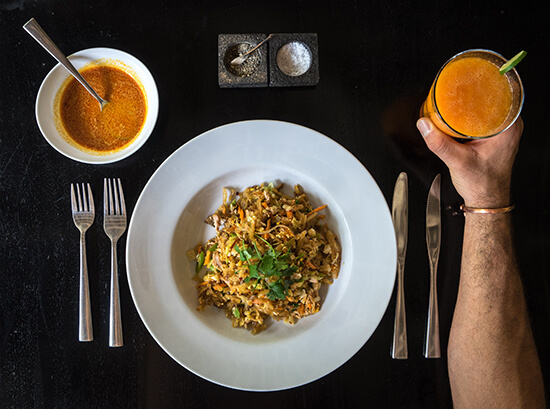 You may be thinking Sri Lankan cuisine is just curry – and you’d be right to a certain extent – but the mix of flavours within the curry-scene here is unreal. Cashew-nut curry, devilled fish curry, pineapple curry, beetroot curry, baby jackfruit curry… the list goes on. Outside of curry-verse there’s plenty more, including some of the Sri Lankan classics like kottu (basically shredded pieces of roti with an assortment of veg and meat), ‘egg hoppers’ (a bowl-shaped pancake with a fried egg in the middle) and ‘String Hoppers’ (rice flour squeezed into thin noodles and then steamed). Just make sure you go with an empty stomach and prep yourself with a week of chilli treatment. 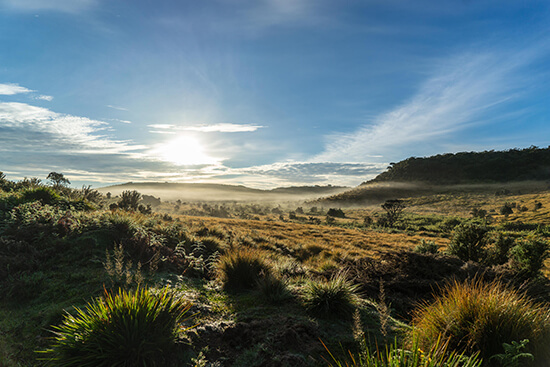 A rocky 2.5-mile walk through the Horton Plains National Park brings you to the World’s End, a viewpoint with brilliant southerly vistas towards the coast. The best time to go is between 6am-10am (otherwise all you’ll see is cloud) which means an early rise if you’re travelling from Nuwara Eliya. Totally worth it for the sunrise over the Horton Plains and, if you’re lucky, you’ll spot deer and other wildlife. Park entry fees are paid on arrival and you can pay more for guided walks. A great place to do this is in Bentota on the west coast. 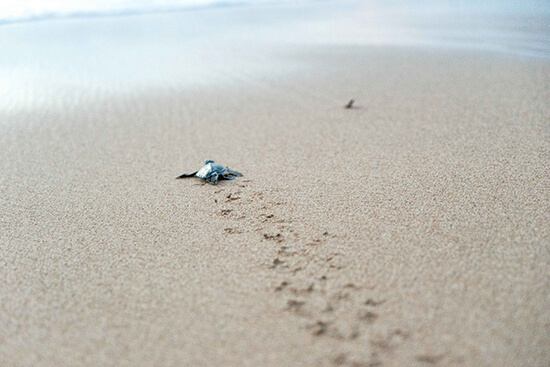 You can visit turtle hatcheries any time during the day but you have to wait until sunset to release the hatchlings. It may feel unnatural releasing baby turtles into the sea, however the whole practice aims to ensure that they make it safely into the ocean under the watchful eye of humans, increasing their 1/1,000 odds of survival. It also gives you the opportunity to swot up on turtle trivia and, most importantly, it provides a bit of income for the local communities that run these turtle hatcheries. You pay for entry, which includes a tour, and then you pay a bit more to help release the baby turtles. The centre of a short-lived ancient civilisation, this is Sri Lanka’s most iconic sight and one that deserves World Wonder status. 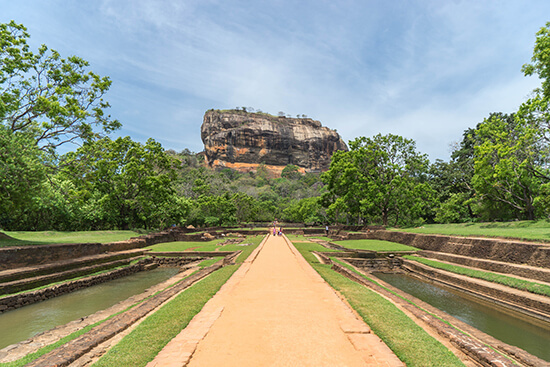 The rocky outcrop of Sigiriya juts out of the plains in a spectacularly conspicuous way, but the view of the rock is only half as good as the view from the top. A collection of precariously placed staircases takes you to the ruins at the top, where you’ll get vistas of a countryside flushed with emerald green. Although the entry fee to Sigiriya is high compared to other sights in Sri Lanka (US$30pp), it’s definitely worth it. Now I know this one is a bit of a curve-ball, but who doesn’t love a bit of novelty on their holidays? 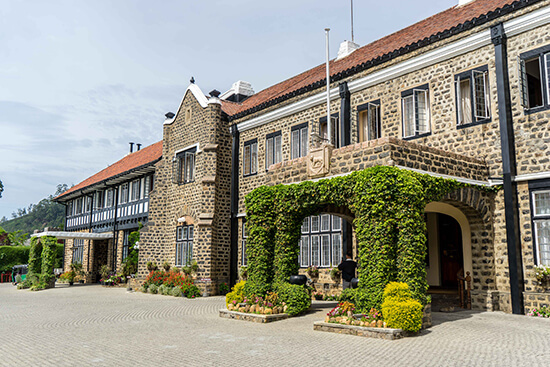 The Hill Club, a former gentleman's club in the Sri Lankan highlands (that didn’t allow membership to women or locals until 1967) boasts the finest cow dung tennis courts in the land. Quite the claim! It’s worth visiting for the spectacle, but you do need to be a guest at the Hill Club in order to make proper use of the courts. Our tailor-made holidays to Sri Lanka can include all these incredible activities – make an appointment to meet one of our Travel Experts and they'll craft an itinerary to suit you.